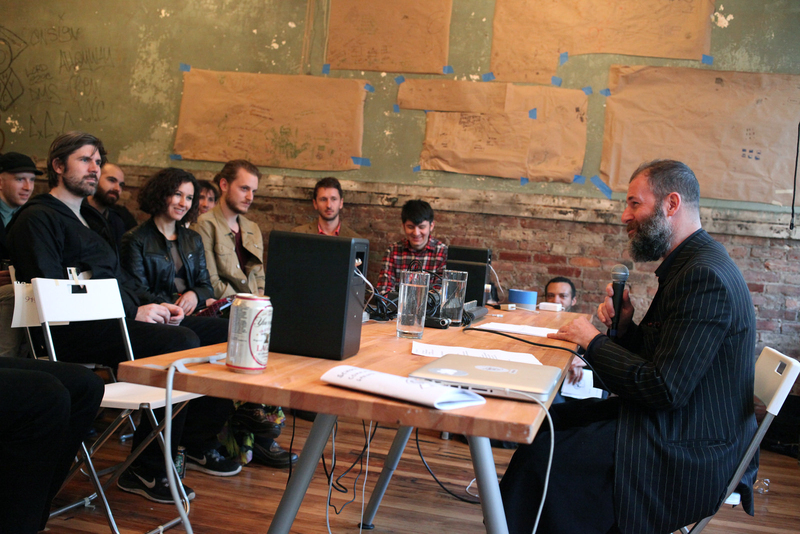 School for poetic computation (SFPC) recently opened a new call for participants for the Fall 2014 term. 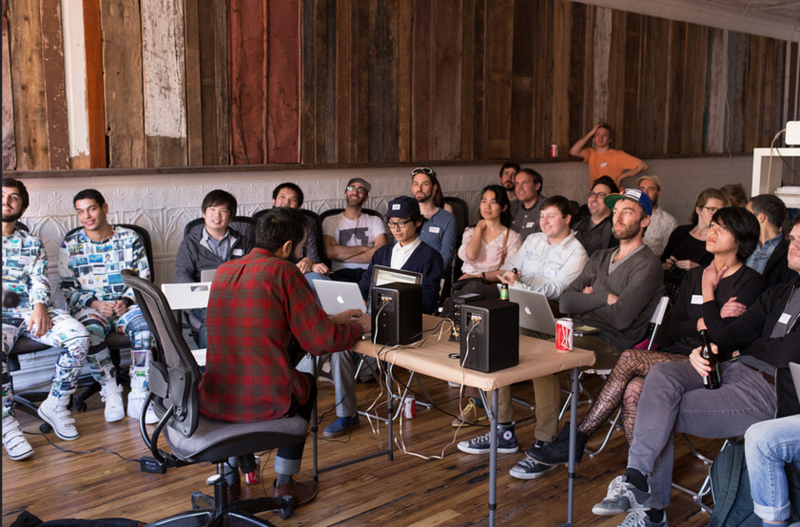 SFPC is a small program run by a group of artists in New York City. 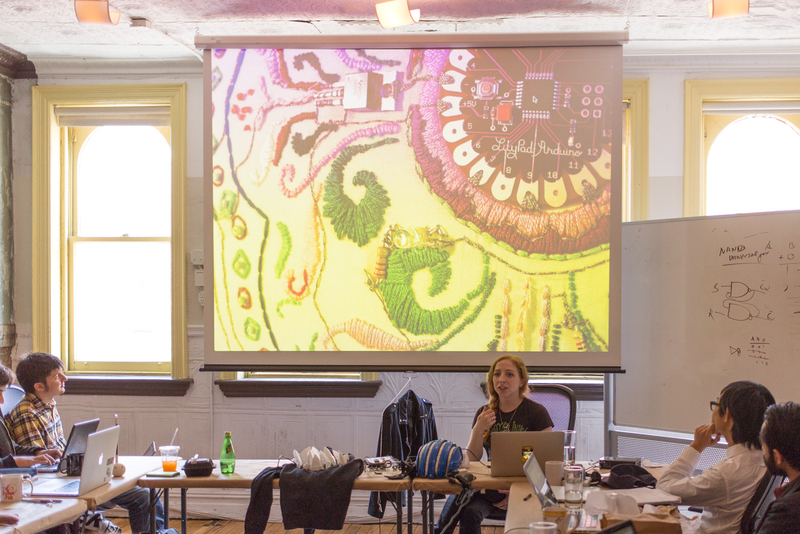 Our classes cover a wild mix of technical, artistic and practical topics like programming for interactivity, physical computing, the Oulipo poetry of Geroges Perec, using the command line for creative work and grant writing. 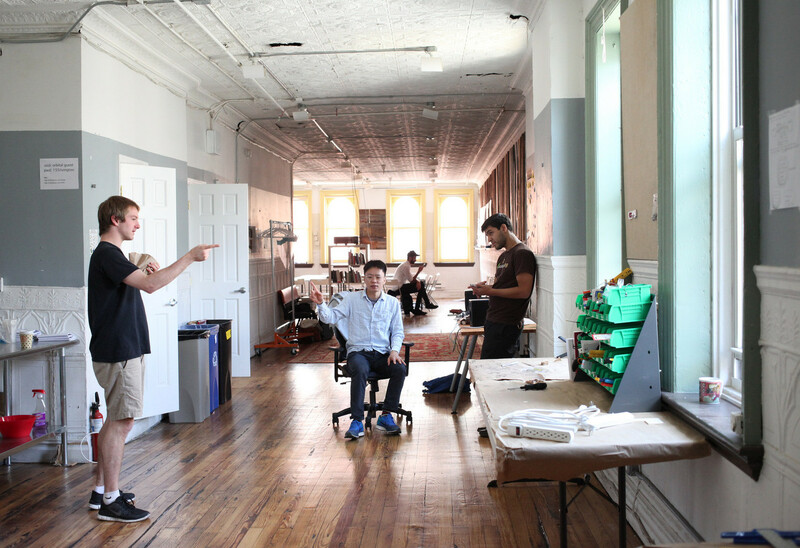 Most importantly, it is a place to try out strange ideas with likeminded people. We started the school last year without explicitly defining the meaning of poetic computation. I liked the fact that we didn’t really know what it meant, the idea of poetic computation was mysterious and began an open ended exploration for everyone. 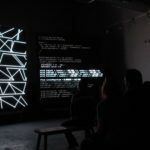 We thought poetic computation could be ‘a space where logic meets electricity (hardware), math meets language (software) and analytical thinking meets creative experimentation.’ The word poetics has its roots in ‘poesis’, which means ‘to make’. Thus, a computational poet can use computational media: code, data, electronics, real world inputs and so on, to create the kind of world they’d like to see. 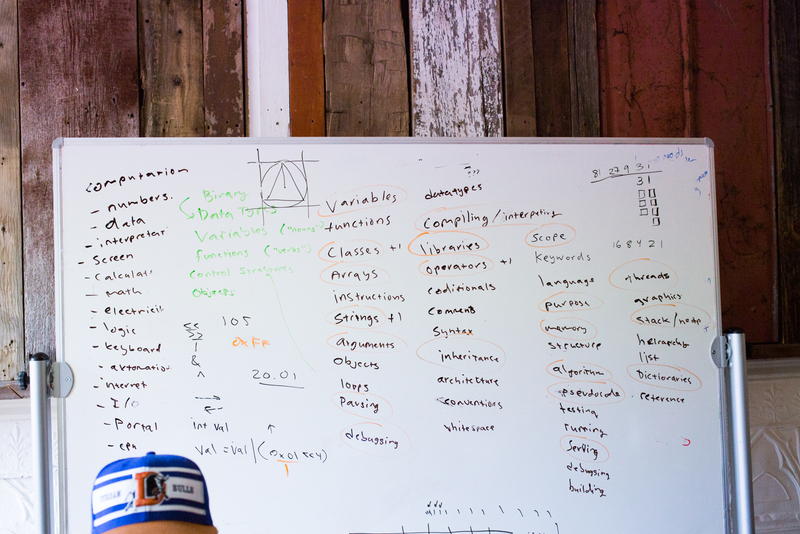 Poetry, like code, is built on abstraction. 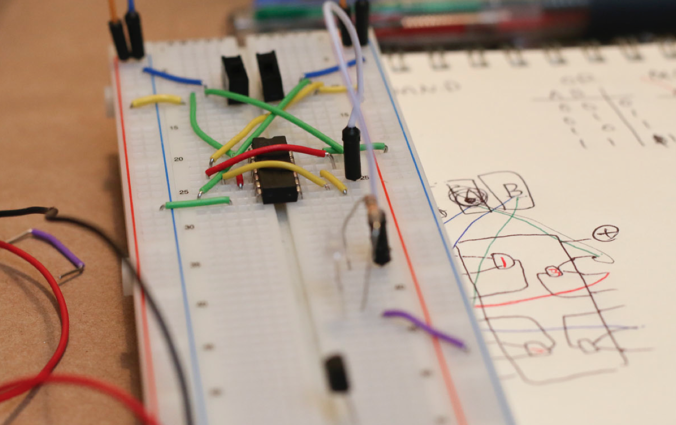 In my class ‘poetics of circuitry’, I ask students to make drawings of logic and electrical signal while prototyping on a breadboard. Simple drawings of logic gates and discrete components quickly become complex map on various levels of abstraction. During one of his lectures, Zach Lieberman talked about the importance of paying attention to typography when writing code. Poetry, like code is made of letters, words, symbols, numbers, indentations and line breaks. For Ramsey Nasser who will be teaching a language design class this fall, code is poetry, tool and a form of expression in itself. 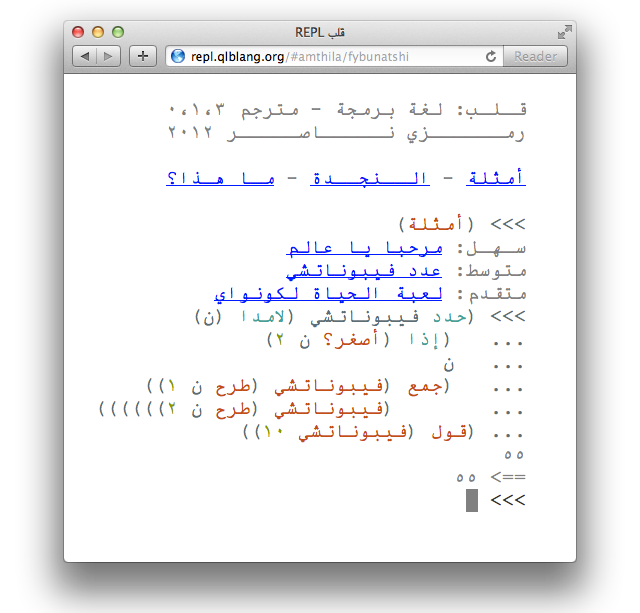 He designed قلب a programming language based on arabic script and continues to explore personal, possibly esoteric, forms of programming languages. 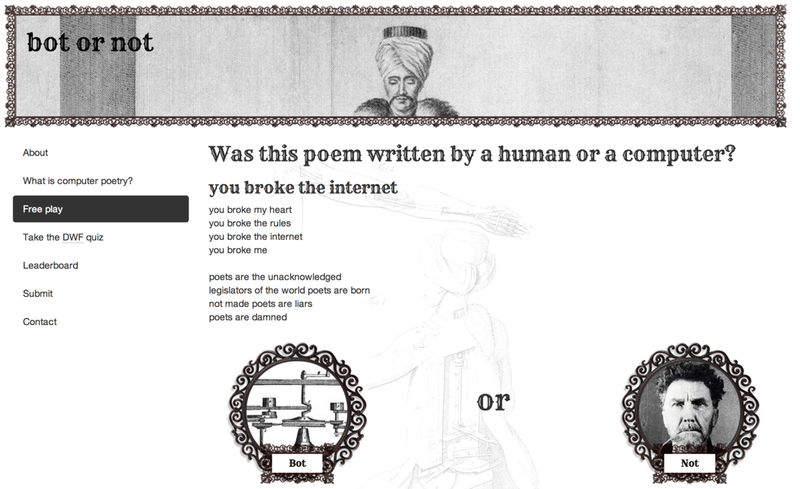 Oscar Schawartz, student from the spring term, made “Bot or not“, a Turing test for poetry. It’s a website where players can read a poem and guess if it’s machine generated or written by human. I got mostly wrong answers. Maybe a bot can trick humans with poetry? Ida Benedetto, student from Spring term who will be joining the faculty this Fall, wrote ” My understanding of poetic computation is that the rules we learn to use these tools, even if they conform to the laws of science and mathematics, are still created by people, so they are embedded with all of our aspirations and dreams and needs. 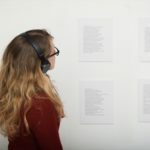 To use them and embrace them in that way can realize their potential in beautiful and poetic ways.” Maybe poetry and code are both human in its essence? Kenneth Goldsmith thinks writers, who experiment with appropriation and ‘uncreative writing’, and coders are quiet similar. “Writers are exploring ways of writing that have been thought, traditionally, to be outside the scope of literary practice: word processing, databasing, recycling, appropriation, intentional plagiarism, identity ciphering, and intensive programming, to name just a few.” Plagiarism is still a taboo in the world of literature, but he has a different perspective on the idea of originality and artistic creativity. “These writers function more like programmers than traditional writers, taking Sol Lewitt’s dictum to heart: “When an artist uses a conceptual form of art, it means that all of the planning and decisions are made beforehand and the execution is a perfunctory affair. The idea becomes a machine that makes the art,” and raising new possibilities of what writing can be.” Quotes are from his piece on Chronicle. 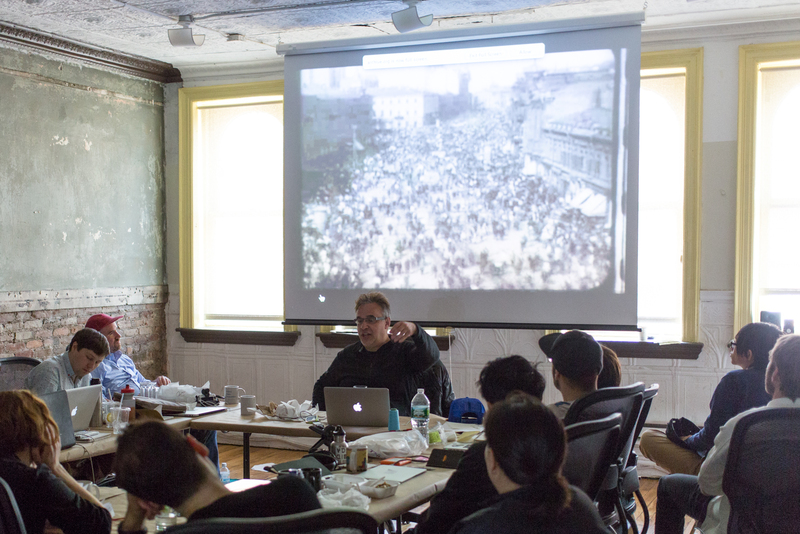 When Kenneth gave a talk on the final day of Spring term, he said “If you are not making art for the intention of having it copied, you are not making art for the 21st century.” It’s likely that he didn’t write those words either. Audio file of the same talk delivered at The Frieze can be found here. Sharing with others and asking them to share likewise has been a tradition in the Art and Technology world. 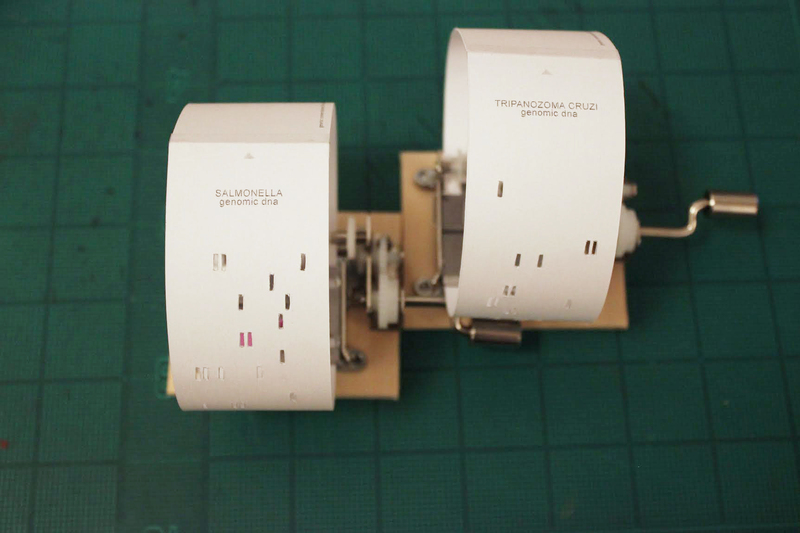 Dan Sandin, a visionary hardware hacker who made a video synthesizer in the early 70s, published a complete tutorial to make a ‘Image Processor’ and asked that he gets 1 good tape from each copy of the Image Processor. For 2014/2015, we decided to focus on new research tracks ‘New audience’ and ‘Assistive technology’. We want to make more projects like Eyewriter, open source eye tracking device, and collaborate with visiting artists like Christine Sun Kim, a sound artist who’s deaf from birth. 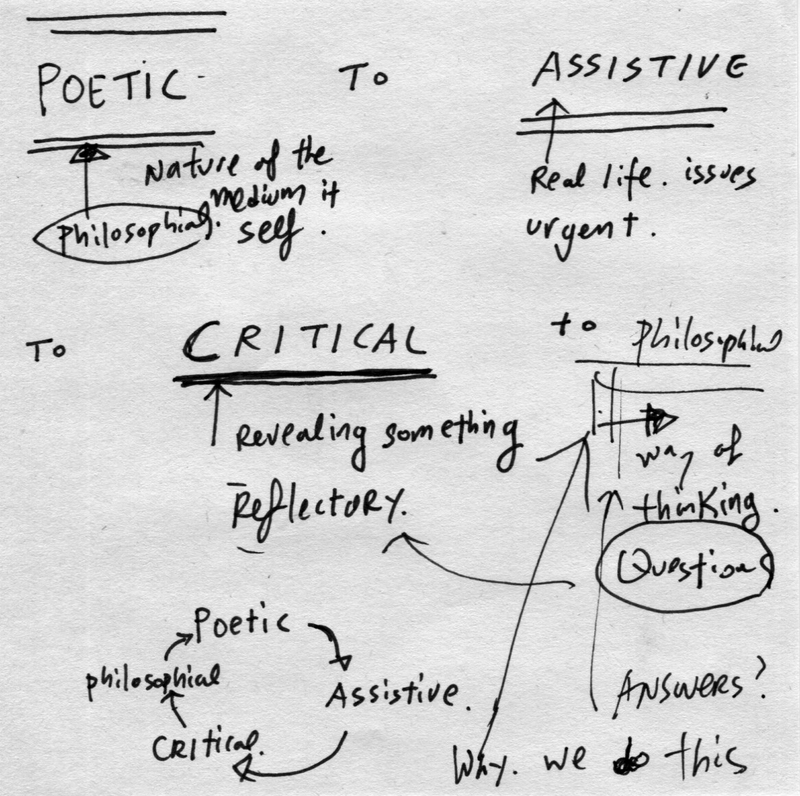 Computation can become a vehicle for poetic, assistive, critical and philosophical inquires. Quoting from our call for participants, ‘With new audiences, we will be trying to answer the question, how can we spread what we care about far and wide and to diverse new groups? 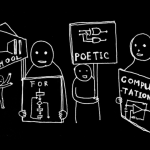 Students focused on this track will be engaged in teaching and designing tools, systems, and approaches to help bring poetic computation to far flung places and communities. With assistive technology, we will examine how computation and artistic works can be enabling forces, helping people overcome challenges, and offering new means of communication and expression.’ More thoughts on assistive technology can be found here. 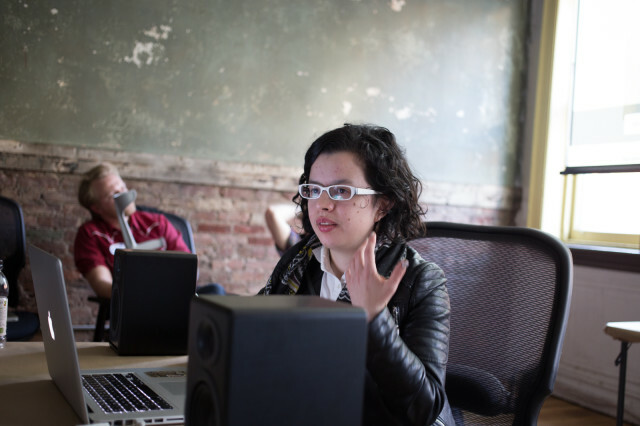 Guest speaker, Becky Stern talking about her work with wearables at Adafruit. We are such a small program that we can only admit 15 students at a time. With the mix of lectures, workshops, assignments and collaborative projects, students seem to find confidence in learning and teaching, and have expanded their sense of community. We have been publishing information regarding cost of running the school, because we think open finance and transparency is important in education. We are looking for sponsorship to lower the cost of tuition and hope to become a non for profit organization in near future. Meanwhile, we operate with participant’s tuition and some income from our workshops outside of the school. 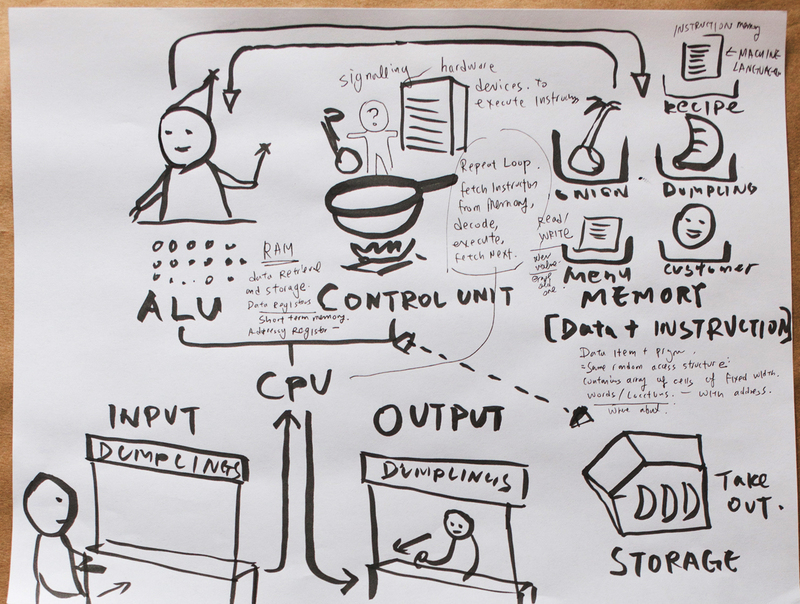 Illustration of Von Neumann architecture according to a dumpling guy, used in my class. 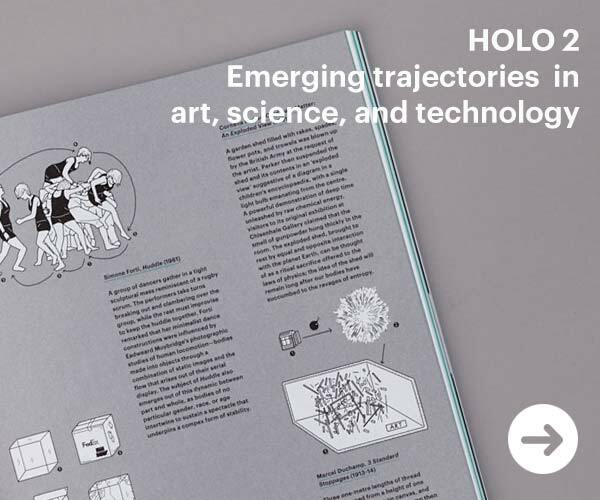 In order to further create opensource models for art and technology education, we help students to become more confident in teaching. We try to invite alumni to teach in the following term and also support them to start their own alternative schools and programs. We are proud of School of MA, organized by Rachel Uwa in Berlin, and OF COURSE, organized by Peng Chang in New York and the many other SFPC alumni who are teaching in universities around the world. Daniel Wilson, who participated in Spring 2014 wrote “I think the conversations weve had in the morning have been really good. We start off with a book or a question, and then it just becomes this group discussion. I’ve also felt that the speakers who have come in have been really great. It risks having the Ted Talk syndrome, where everyone seems like this unattainable superstar when they come in. But then I’ve realized that this is years and years and years of work condensed down. 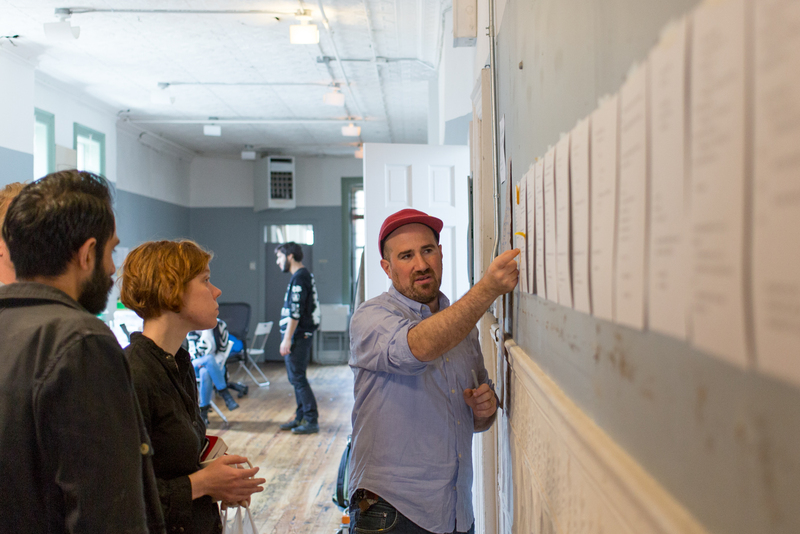 I thought learning about what tool safe available and how people are using them was really eye opening.” from interviews of SFPC participants by Oscar Schawartz. Spring 2014 participant Diana Sánchez Barrios presenting her work. More information on student’s projects can be found here. We are looking for more visiting artists and most importantly participants to join us this fall. 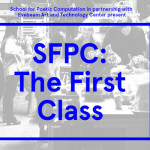 For more information, check out http://sfpc.io/participate-2014 We are also planning a short day long workshops on programming and poetry in August to raise fund for the fall term. Follow us on twitter to get the latest information. Photographs on this post are by Taeyoon Choi, Tega Brain and Ryota Okawa. Taeyoon Choi is one of the co-founders of School for poetic computation. He was a fellow at Eyebeam Art and Technology Center and director of Making Lab, a community makerspace run by media artists, at Anyang Public Art project in South Korea. His art work, collaboration and curatorial projects have been presented in underground venues as well as art festivals around the world. At the moment he is working on a commission from Art + Technology Lab at Los Angeles County Museum of Art and a project at The Frank-Ratchye STUDIO for Creative Inquiry at Carnegie Mellon University. Taeyoon Choi is an artist based in New York and Seoul. 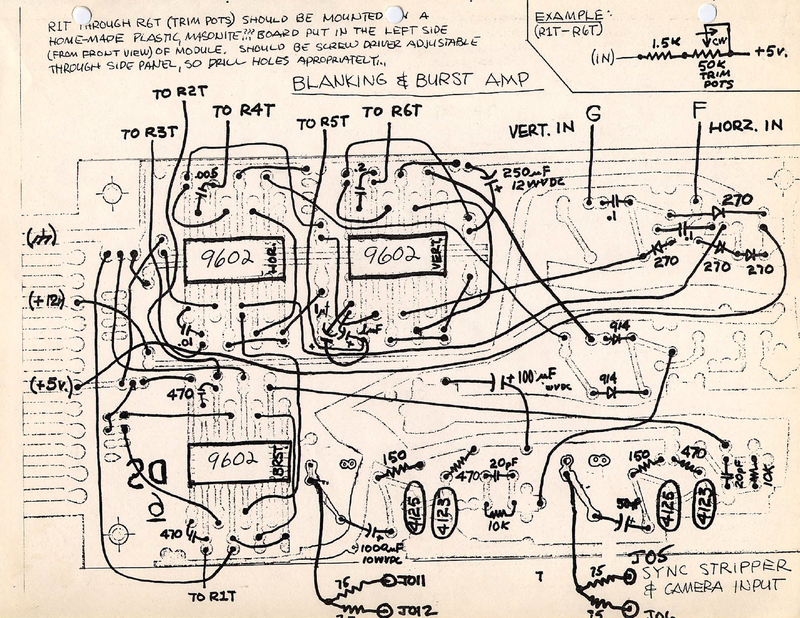 His art practice involves electronics, drawings, and storytelling that often leads to intervention and performance. He was an artist-in-residence at Eyebeam Art and Technology Center and Lower Manhattan Cultural Council. Choi cofounded the School for Poetic Computation in 2013, where he continues to teach. Recently, he's been focusing on unlearning the wall of disability and normalcy, and enhancing accessibility and inclusion within art and technology.